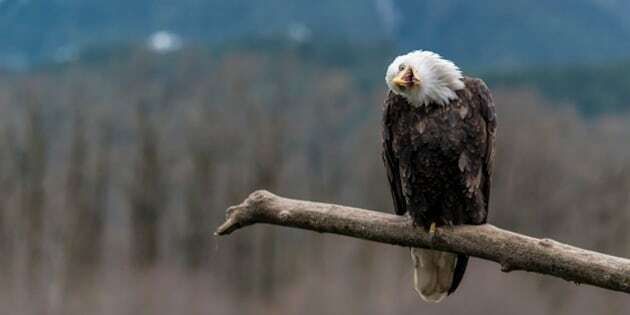 While photographing the wildlife in Squamish, B.C., Martin Gregus Jr. grew so fond of a particular bald eagle that he ended up naming him James. James would sit only feet away as Gregus Jr. drank his tea each morning, and ended up becoming a major part of the 17-year-old photographer's new project "Where Eagles Dare." Taken during the fall of 2013, "Where Eagles Dare" captures salmon spawning and eagle migration in Squamish and Harrison Mills. The North Vancouver photographer spent two months living among the wildlife, getting to know creatures like James and capturing them in their most natural state. Gregus Jr. used underwater camers and flying drones to photograph these amazing moments. For him, the trip was filled with memories that few get to experience. "During the morning me and my dad followed bear and wolf tracks before setting up our main station in the middle of all the action at the Chehalis River Estuary," he told The Huffington Post B.C. in an email. "I waded up the river with a GoPro at the end of a monopod and the quiet river quickly turned into a sea of hundreds of jumping salmon ... I photographed fish fighting for their lives in the shallows." This isn't the first time we've seen amazing work from Gregus Jr. Last November, he was named GDT European Wildlife Photographer of the Year for his photo of a whale that was beached in White Rock.